Fleuroselect is proud to present their coveted 2019 Gold Medal winners. Each one of these breeding breakthroughs obtained an outstanding score on innovation, beauty and garden performance. Here we feature Benary and their Petunia x hybrida winner. Petunia x hybrida lands Gold for Benary! Benary introduces the first genetically compact Grandiflora Petunia with a star pattern. A Petunia x hybrida success story! HD Rose Star shows a multitude of flowers with a unique colour pattern in this type of Petunia. 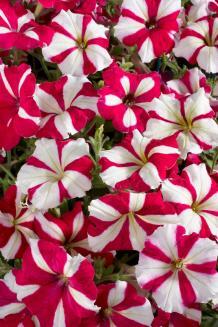 Rose Star is a one-of-a-kind addition to any existing genetic compact Petunia growing scheme. The retail sector will love the idea of offering this popular star pattern now available also in compact, big-flowered Petunia. The magnificent colour combination and plant vigour also in cooler climates will convince any consumer.